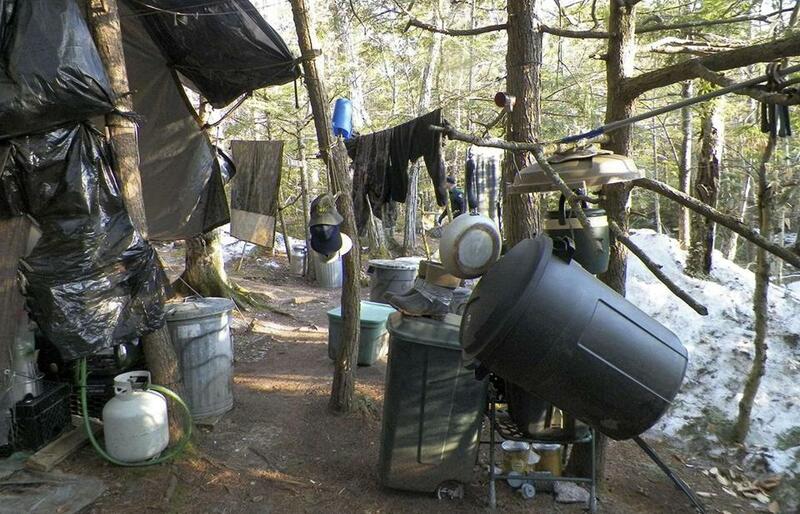 Christopher Knight’s campsite, about a 50-minute walk from where he was arrested, yielded clues about how someone might spend years outdoors: Tarps, clothing, propane tanks, and sleeping bags to keep him warm and dry were strewn about the site. 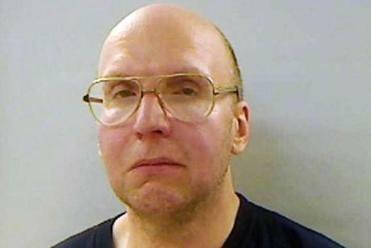 ROME, Maine — Christopher Knight told police he had lived undetected in the woods for 27 years, spoken to only one person in that time, and not made a single purchase since the mid-1980s. But Knight knew how to steal, authorities said, and how to stay hidden even though his tent lay within 600 yards of the nearest cabin. Such is the singular world of the man dubbed the North Pond Hermit by the long-spooked residents here, where Knight is believed to have committed more than 1,000 burglaries for food, fuel, tools, and clothing since he left a computer-technician job and retreated to the forest. Now, the 47-year-old is residing in the Kennebec County Correctional Facility in Augusta, facing burglary and theft charges, as banjo players rhapsodize about him and bewildered Mainers shake their heads at the thought of 27 winters in the open. “It’s ironic that someone who wanted to be completely anonymous is now the most famous citizen in Maine,” said District Attorney Maeghan Maloney. Knight’s attorney, Walter McKee of Augusta, declined to discuss the case. Until Knight’s arrest in April, police had been stymied time and again in their quest to find the elusive hermit. Searches had been conducted in the woods, and troopers slept overnight in the camps. Wildlife cameras in this part of the Belgrade Lakes captured only rare, fleeting images of a man who seemed too well-dressed to be a survivalist. For year-rounders and seasonal visitors to North Pond, about 75 miles north of Portland, Knight is also a scavenging thief. He never physically harmed anyone, but his unseen presence frightened children and unnerved adults for years. The shores of bucolic North Pond became blanketed with a sense that someone always was watching. Christopher Knight told police that he went into the woods in 1986 and never looked back. He is now accused of scores of burglaries and thefts. Knight’s alleged haul on the night of his arrest confirmed that description. Wearing new jeans and a sporty outdoor jacket, police said, Knight was found lugging a roll of Hormel bacon, 10 Sweetheart sweet tarts, two tubs of Folgers coffee, Kraft marshmallows, and a bag of Humpty Dumpty potato chips. There also was an L.L. Bean backpack, Armitron watch, Stearns poncho, and a roll of electrical tape. 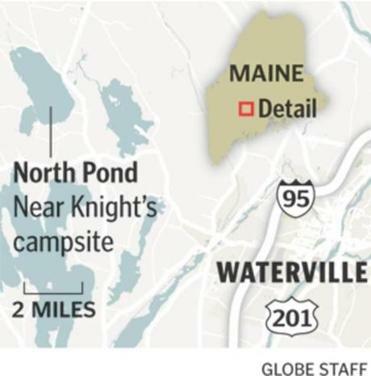 David Proulx of Waterville, who lives on North Pond from May through October, said he believes Knight burglarized his cottage about twice a year since 1990 — close to 50 times. “We knew his pattern pretty good. He’d hit us early in the spring,” said Proulx, 65, who has been coming to the cottage since the year he was born. Knight’s targets: propane tanks, coolers, rain jackets, food, and even a battery-operated 5-inch television. “I’d leave him a note: ‘Don’t break in. Just tell me what you need, and I’ll put it by the side of the road,’ ” Proulx said. The hermit never took him up on the offer. Proulx is quick to note that Knight rarely took anything valuable and was careful not to cause any damage. “It used to be a big joke: How many pairs of pants do you have left?” said Melinda Hess, 60, who lives about a mile from Knight’s campsite. Knight read voraciously, Vance said, and kept up on current events through battery-powered radios. “Anything he could steal to read, he’d steal,” the trooper said, including Parade, Cosmopolitan, and Vanity Fair magazines. Some residents even left books for him to take. Knight did not know the name of the town where his camp was located, Vance said, but he did know about the celebrity Kardashian sisters. Knight had no identification when he was arrested after a motion sensor detected him at Pine Tree Camp. He declined to speak at first but gradually opened up, even though Knight said he had learned from “cheesy television shows” that he should speak with a lawyer first. “He admitted to approximately 40 burglaries a year for the last 27 years,” Vance said. Knight did not know if his parents were alive. He also told Vance he had never been sick “because that required human contact.” Knight could not remember exactly when he left for the woods, but said his decision coincided with the year of the Chernobyl nuclear accident in Ukraine, in 1986. Through trial and error, Vance said, Knight learned how to live through the harsh Maine winters in a campsite obscured by thick trees and ringed by large boulders. He stockpiled enough food in the fall to last until March, deliberately put on extra weight for the winter, and traveled only at night. Mosher-Towle and other residents are deeply skeptical that Knight lived outdoors in bitter, sub-zero conditions. Instead, they speculate, he probably eased inside one of the dozens of cabins he had burglarized. But Vance, who has spoken with Knight many times, is convinced he stayed outdoors year-round. “There’s no doubt in my mind that this man lived in the woods for 27 years,” the trooper said. When Knight led her to his home, a 50-minute walk from Pine Tree Camp, Vance saw a mattress mounted on a frame, a nylon tent covered by tarps, a clothesline, and a bumper harvest of propane tanks for cooking. A half-dozen sleeping bags helped keep Knight warm and dry in the coldest conditions, Vance said. All of it, Knight told police, had been stolen. Before the woods became home, Knight grew up in the rural town of Albion, near Waterville, and wrote in his high school yearbook that he wanted to work with computers. The glasses he donned for his 1984 yearbook picture, Vance said, appeared to be the same glasses he wore on the night of his arrest. Knight said he had no other possessions. No journals, no clothing of his own, no identification. He did not have a criminal record before his arrest, and no missing-person report had been filed. At his mother’s home, a two-story wooden farmhouse near a lake in Albion, an elderly woman waved away a reporter and quickly closed the door. When two of his brothers visited Knight in jail, Vance said, they had to introduce themselves. Knight expected to die in the woods, Vance said, but he could not articulate why he decided to live there. He liked reading about hermits as a child, he told the trooper, but nothing traumatic had happened in his life. Now, he awaits a mental evaluation while being held in a six-person cell at the Kennebec County jail. Knight is joking, putting on weight, and looking healthier, Vance said. Maloney, the district attorney, said the case, which carries a maximum sentence of 25 years, is about more than crime and punishment. “I’m looking at what can I do to protect the community, to make sure that he’s not a threat to the community, and I’m also looking at what I can do to make the victims whole,” Maloney said. That could include restitution, she said. Although Knight has not earned a penny for 27 years, Maloney said such compensation could come from future earnings. Another, quicker form of restitution is expected to greet the North Pond community this summer. “People will come to camp with a lighter heart. The sense of security will have returned,” Mosher-Towle said.